We read the short story while dinner was cooking and I was prepping everything before daddy got home. Our oldest had fun picking out the gems for her Obedience Chart. She was super excited about making this so I was glad to have made sure to pick something out beforehand and have everything ready to go. It took me maybe 10 minutes start to finish. 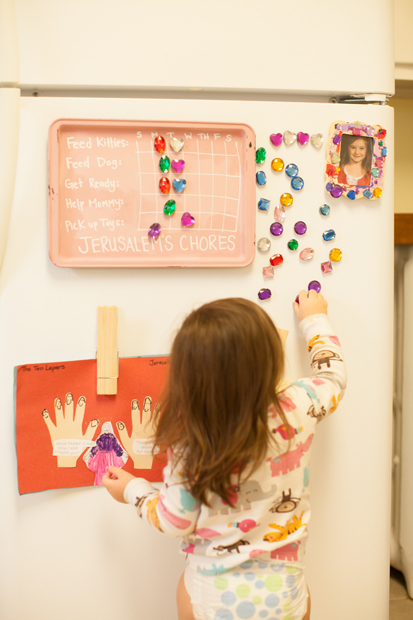 With her help as she shared some of the chores she likes to do and things she wants to help with at home I wrote down some chores and made a days of the week little calendar. Then I hot glued the gems she had chosen onto the round magnets. Since I choose to put our chart in the fridge I glued magnets to the backside of the painted cookie sheet and viola I was done. Fast Forward and so far this week she has been super excited to do her chores and has kept up with everything each day. It has helped me realize how much she does help me because she’ll remind me that she already did 3 mommy helps that day 😉 which I love that she kind of tips her eyebrow at me like I do to her when she asks for milk without a please and then says All right… I’ll help you again but you better say please. Loving day one and feeling so excited for day two. © All photo credits to Ashleigh Rachel Photography unless otherwise attributed.